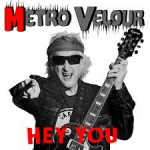 Share the post "Album review: METRO VELOUR – Hey You"
Based in the small picturesque village of Montauroux in the Côte d’Azur region of the south of France, Metro Velour are an old school garage punk band. The four-piece is composed of Sebastian Smith (rhythm guitar and vocals), Louis Chevallier (lead guitar), J B Caramellino (drums) and Nico Pasqual (bass). While the latter three are all French, the front-man, Sebastian Smith, is actually an old English rocker whose been around the music scene a long, long time – ever since he formed his first band in 1959, aged 17! While plenty of us following Get Ready To ROCK! will counter that music today is not all X Factor and manufactured pop and that there are decent new rock bands about if you look that bit harder, nevertheless you cannot fault Smith’s (and the rest of the band’s) enthusiasm in pursuing their mission. This entry was posted in ALBUM REVIEWS, ALBUM REVIEWS (Mobile), All Posts and tagged album, garage rock, Hey You, Metro Velour, New York Dolls, punk, review, rock, Sebastian Smith, The Ramones. Bookmark the permalink.